1 – A new federal plan for the Great Lakes will focus on protecting water quality, controlling invasive species and restoring habitat over the next five years. The Great Lakes Restoration Action Plan II. The new Great Lakes Restoration Initiative (GLRI) Action Plan was released this week in Chicago. It lays out steps that the U.S. Environmental Protection Agency and other departments will take during Fiscal Years 2015 through 2019. A federally funded Great Lakes Restoration Initiative was launched in 2010 to accelerate efforts to protect and restore the lakes. The new action plan will focus on cleaning up additional Areas of Concern in the Great Lakes, preventing and controlling invasive species, reducing nutrient runoff that contributes to harmful and nuisance algal blooms, and restoring habitat to protect native species. Money from the Great Lakes Restoration Initiative has been used in recent years to double the acreage enrolled in agricultural conservation programs in watersheds where phosphorous runoff contributes to harmful algal blooms. That includes western Lake Erie, Saginaw Bay and Green Bay. Congress has appropriated $1.6 billion since 2009 for the restoration effort. 2 – A new nature preserve is opening in Midland County. 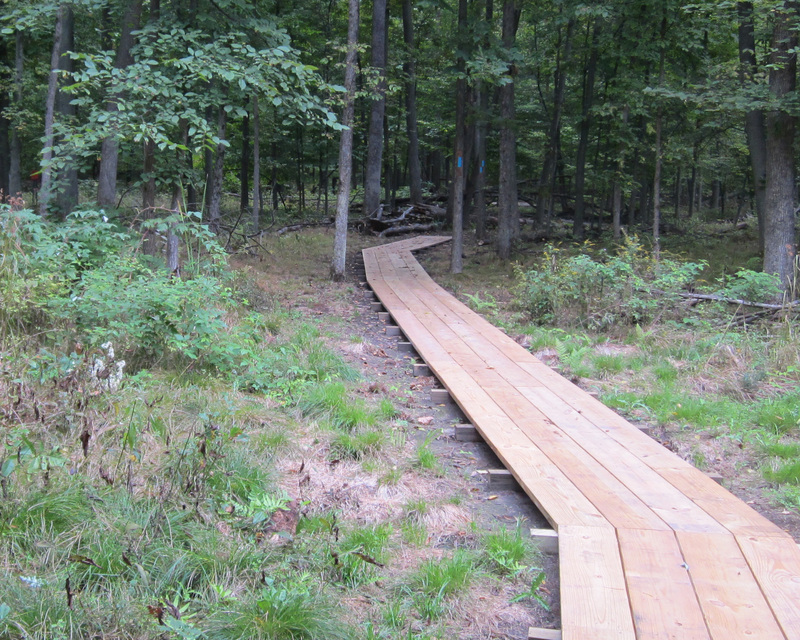 A boardwalk built by an Eagle Scout candidate leads visitors through wetlands at Forestview Natural Area. Credit: Little Forks Conservancy. The 70-acre Forestview Natural Area will be opened to the public next month. The Little Forks Conservancy is hosting an event at 1 p.m. Oct. 12 to mark the opening, and guests will be invited to explore the preserve’s 1.25-mile trail loop. The Conservancy purchased Forestview Natural Area in 2012. The new preserve is located directly across the Tittabawassee River from the Conservancy’s 419-acre Riverview Natural Area. The trail was constructed last fall by volunteers from CPI Engineering. Local Boy Scouts led projects to place boardwalks along the trail, and a bridge over a small waterway on the property. The preserve is home to many species of reptiles and other amphibians. The riverbank is a roosting spot for bald eagles. For more information, see littleforks.org. 3 – Lake Huron’s Thunder Bay National Marine Sanctuary is a whole lot larger. The National Oceanic and Atmospheric Administration has expanded the boundaries of the sanctuary from 448 square miles to 4,300 square miles. The area now includes the waters of Lake Huron adjacent to Michigan’s Alcona, Alpena and Presque Isle counties. The expansion is based on several years of research, and protects an additional 100 known and suspected historic shipwreck sites. The Thunder Bay National Marine Sanctuary, headquartered in Alpena, is one of 14 national sites and the only one in the Great Lakes. Thunder Bay features some of the world’s best-preserved shipwrecks, and visitors can explore the underwater sites through diving, snorkeling and kayaking. The sanctuary’s Great Lakes Maritime Heritage Center, also in Alpena, draws more than 80,000 visitors annually, and features more than 10,000 square feet of exhibits. Thanks for picking up the story!